Real mixture of couples, old and young and families, with a fantastic entertainments team. Food has something for everyone. Beautiful selection of fresh salad at all meals, and help yourself to the tasty ice cream all day. The Cook and entertainment team was fabulous, fun and friendly, and can highly recommend the raise the roof night; it should defiantly not be missed. The pool is not heated but most of them aren't where the weather is so warm and it obviously only feels so cold because of the intense heat of the afternoon. Hotel tip: Block 4 or 5 terraces get the afternoon sun. Cannot fault this accommodation, very spacious modern and clean. Cleaners come in 5 of 7 days, look out for Jessica on the bar in the afternoon, she’s super friendly and fabulous. Bar staff were not interested in serving you, when they saw you coming over, they walked off and went to room at back of bar and stayed there. One person was standing there for ages, when they came back - no apology. Food was nowhere near as good as last year. Room had towels changed once, and floor moped once in a week. No bed change, cockroaches in room and covered in ants. Outside stairways looks scruffy all paint flaking of everywhere. 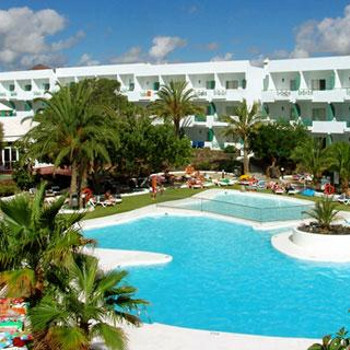 Apart from hotel Costa Teguise is lovely. It’s always a worry when you book a cheaper type of hotel, but we could not fault this one, the food was excellent with plenty of choice and loads of it. The room was clean and quite large with bedding and towels changed every other day, lots of sun beds round the pool and a nice bar with evening entertainment. The hotel is a short walk through the barren landscape to the beach and bars. The staff were great especially the English entertainment team who kept the kids happy throughout the day, all in all a great hotel. It is a good 3 star hotel. Food always hot and various food throughout the day; always something for most people. Local beer was fine although the coke was not great. Room was fine and the beds and bedding were good, bathroom and facilities were good too. Around the pool was always clean and the entertainment team were there with various games and quizzes and the usual night time show followed bingo and kids time. In all we had a great time and found this to be a decent hotel/apartments. Very basic room, though immaculate with fridge, cooker and sink. Bathroom clean though grout and tiles not pretty. Shower didn’t show much hope of being up too much but was really really good. We hired a kettle, and TV for films to watch during siestas, both were cheap. Maids swept floor and cleaned bathroom, made beds, changed towels. Not too fussed if they hadn’t for the week. We looked over the fabulous and (freezing, as is the sea) pools full of children having the best time. You hear the reps on the poolside on microphones most of the day doing their entertainment. We weren’t there for long each day but it didn’t bother us and enjoyed watching from our balcony. Not one bug found. Brilliant staff, brilliant food, brilliant food, brilliant food, good free lager, dreadful local shots. Evening entertainment for the 3 year olds was fab. Reps were superb with them. Adult stuff wasn’t for us but we didn’t expect it to be. Beach 10-15 minutes away with so many bars, cafes, restaurants, fab nightlife on the way. And cheap and friendly. Beach areas very nice! Hotel can be described as sat in a 5 minute walk of wasteland but that’s the natural terain. Hotel, due to pool and food is a fab base. It was so quiet morning and night, many spare sunbeds always, seats always available at meals, we went October. Blasting sunshine from 10am till 5pm, when the pool emptied and resort went silent. 3 star and all we could have hoped for. First things first, food was fantastic and the staff were fantastic. The entertainment was mainly for the kids. No organisation on putting the towels out on the sun beds, most were put out by midnight. Kids entertainment good and the team work hard. There are some nice bars and shops locally. The beach is nice. Unfortunately the weather was not as expected, it was warm but the sun not out until after mid day most days. We did have a nice holiday and it was good fun. Arrived at the hotel and was greeted by the very friendly manager who quickly checked us in and explained the all inclusive entitlement to us. Our room was on the fourth block on the 3rd floor and was nice and clean, quite spacious with a little kitchenette, however no kettle. The balcony overlooked the pool which looked lovely. The restaurant was small but clean and you either had to go early to meals or late as they shut the doors when full and you had to queue outside for a table. Plenty of choice of food, there was always fish, chicken and meat dishes every day, some of them cooked in front of you and the usual chips, veggies and a lovely salad bar. At breakfast there was the full English different cereals and fruit and always fresh croissants, rolls etc. However there was only 1 toast machine on which you could get 5 slices of toast so that was always queued up. Different juices, fizzy pops and beer and wine was served during meals on a help yourself basis but if you wanted spirits or something then you had to ask a waiter, who were always very busy so we never bothered. You could always get something to eat as when the restaurant was closed for meals it was open for snacks and you could get sandwiches chips and ice-creams (and the ice-creams that you helped yourself to available after lunch and throughout the afternoon were actually in cornets not silly little plastic cups.) During the day you came into the restaurant to serve yourself drinks to take out to the pool which was good as you weren’t waiting for bar staff and in the evening the bar around the corner opened up for drinks and the entertainment. The weather wasn’t brilliant during our stay , it was cloudy and very windy in the mornings and we couldn’t sit out till after lunch, don’t know if it was the time of year we went, 8th-17th April or if we were just unlucky. The first morning I woke up at 7.30 , had a look out over the pool area to find most of the sunbeds had towels on already so I resorted to setting the alarm for 7 o clock to get some decent ones together. The pool area was kept lovely and clean and looked very inviting , unfortunately the water was as cold as ice and my 2 boys wouldn’t go in it until the last day which is not what you want when you’re on holiday with children. The evening entertainment was quite good, my boys enjoyed the mini disco with the reps, who were very good, Kier, Paris Charlotte and the others did a great job and we saw reptile and birds of prey shows while we were there, you do get conned into buying photos at the end of the shows though and at 10 euros each there not cheap. The beach was about a 10 min walk away across some scrubland and the shops were about the same distance. All in all we had a brilliant holiday spoiled only by the weather, the hotel was brilliant and I would defiantly go back. Food was ok, entertainment was not! Stayed for week all inclusive, the food was ok breakfast and lunches were better than the dinners, lager, white and red wine were available throughout the day, you had to pay for rose wine which I thought was quite strange. Can’t get spirits till the bar in the entertainment room opens at 5pm. The entertainment was very repetitive, bingo, play your cards right, nothing for kids, we only went in for a drink after our dinner then went out to resort, only so many times you can listen to bingo being called!! We stayed for one week at the Ficus. Although the hotel was set back from the main street, there was a gravel path which took you towards the main street, just five mins away. Hotel had a relaxed atmosphere, staff were always helpful, from the reception to the bar staff and cleaners. Apartments were quite large and we had a fridge and cooker even though we were all inclusive. Furniture and TV were modern and bathroom facilities were good.Beds were made regularly and towels changed. Restaurant food was varied, something for everyone and although I’m fussy what I eat, I still found something on most nights with full English breakfast in morning. Food was sometimes a bit repetitive and we did eat out a couple of times just for a change really. Entertainment a bit boring! Bingo, MR Ficus competition twice! and other games, but didn’t stop in once we had evening meal! Something on every night though for those who didn’t venture out. Plenty sun beds though the pool was a bit cold this time of year. On the down side, my partner was ill for 3 days, sickness. We don’t know if it was anything to do with the food, but a couple at a nearby hotel were ill too and there were other cases round the resort. Great break for Christmas and New Year! We went to the Ficus for Christmas and new year 2010, our party was 2adults 1 child.! We had a ball and loved every minute of it, from staff to guests we met some fantastic people. The entertainments team work there socks off they never stop, they are absolutely fab! The only bad thing I can say is the decor in the rooms is a little dated but don’t let that deter you from going.